I like playing with numbers and – more often than not – the numbers do tell the tale. The human species comes in a variety of colours and this skin colour is a genetic trait. (They are different races whether we wish to admit to it or not but they are all part of the same species). I choose to classify the world’s population as six colours. Of course this is just playing with the numbers. Of course there are mixtures of races in all countries. I could as well have included SE Asia in the brown as the yellow. My purpose is to picture the primary colours of the world population as they change and not to distinguish every hue. But demographic numbers are cold and inexorable and inevitable. Fertility rates do not change that quickly and intentional changes are not that easy to achieve. The effects of the Chinese one-child policy will really kick-in only in the next 50 years as Chinese population declines. Between 2050 and 2100, China will face the aging challenge faced by Japan already today and which will be increasingly faced by Europe in the next 30-50 years. Indian population will peak around 2050 and will then decline as the reductions of fertility now taking place work their way through. Africa will only just be reaching peak population by 2100. By 2100 world population will have stabilised at around 10.5 billion and may be slightly on the decline. 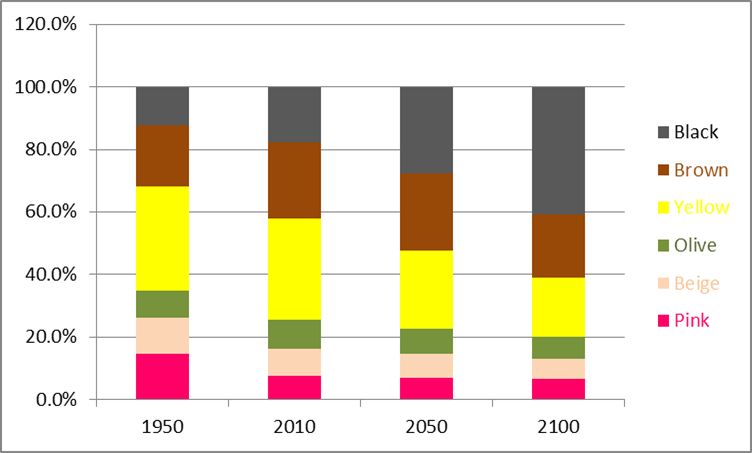 The changes to the colours of the world’s population are already fixed for the next 100 years. This is just a picture of what humanity will look like in 2100. The last 50 years has seen a sharp decline in the pink races and an increase in the brown and yellow races. The next 50 years will see the yellow races beginning to decline and the brown and black races increasing sharply. For the 50 years to 2100, the browns will stabilise and only the black races will still be increasing. By 2100 a relatively stable mix of races may be in place. If fertility rates develop as expected then the mix of races in 2100 is likely to persist for some considerable time thereafter. This picture is silent as far as immigration is concerned and is also silent as to the extent to which races are mixing. It is my perception that the US and Australia are much more open to the mixing of races whereas Western Europe, Japan and China are not. Eastern Europe is still stuck in a 1950’s world-view of humanity and its races. The challenges of aging faced by Japan now and later to be met by Europe and China will likely use immigration as one of the main solutions. But it will probably take at least 3 or 4 generations before the genetic mixing of races is accepted in these countries. Paradoxically it is the “politically correct” version of multiculturalism prevalent in much of Western Europe which actually preserves races in their silos and prevents mixing. They have missed the fact that just trying to preserve cultures of the past does not help in creating the culture of the future. But they cannot live in the past forever. There will be greater movement of peoples around the world. People will move from countries with low GDP. They will move to countries with high GDP’s but where the aging problem is acute and where the proportion of productive population must be increased to cope. Movement of people in large numbers will cause many problems for the immigrants themselves and for the areas of aging population they move to. But for the next 100 years this shift of peoples northwards will – and has to – increase. John Derbyshire: Consider the numbers. The three countries contributing the most to the Children’s Crusade coming in across our southern border—Guatemala, El Salvador, and Honduras—are home to 29 million people. If the entire populations of those three countries decamped to the USA our population would increase only nine percent. Many more than three countries are contributing to the human flood into Europe across the Mediterranean and through Turkey. The five most commonly mentioned in news reports and the Eurostat databases are Syria, Eritrea, Somalia, Afghanistan, and Sudan–homelands for a total of 106 million people. If they all moved into the 28-nation European Union, the EU population, currently 506 million, would increase by 21 percent. …..
…… Thus, while both the USA and the EU live figuratively in the shadow of dams with vast numbers of wretched people in dysfunctional nations backed up behind them, the EU’s dam is far wider and higher than ours, the shadow correspondingly deeper. The wealth gap is greater over there, too. GDPs per capita for Guatemala, El Salvador, and Honduras are 10, 14, and 9 percent of the US figure. Compare Syria, Eritrea, Somalia, Afghanistan, and Sudan at 15, 3, 2, 3, and 8 percent of the EU average—and that Syria figure is from 2011, before the civil war. Africa as a whole, even with oil-rich Nigeria and Angola and still-functioning South Africa, is far poorer than Latin America. This entry was posted on July 26, 2014 at 7:55 pm and is filed under Demographics. You can follow any responses to this entry through the RSS 2.0 feed. Both comments and pings are currently closed.